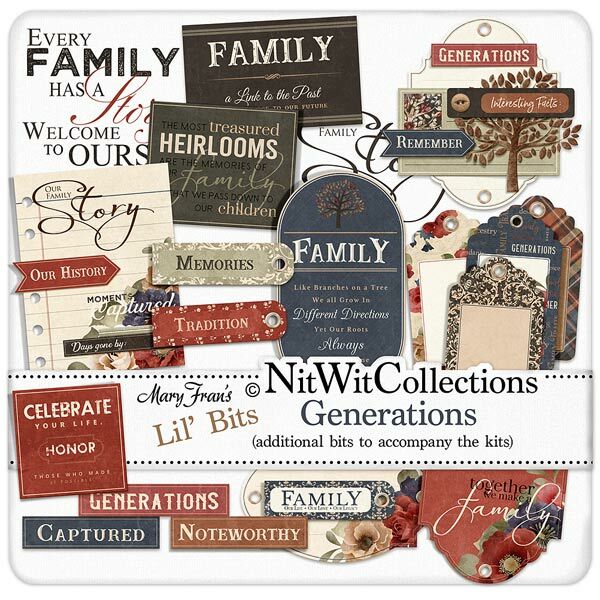 Lil' Bits "Generations" supports your creativity by giving you several uniquely clustered and designed elements to quickly add to your ancestry scrapbook layouts, mini albums and cards. Don't miss out on these digital elements as they are not included in the FQB "Generations" Collection so please don't miss out on owning and creating with these elements! 1 Clustered element highlighting "Generations", "Interesting Facts" and "Remember"
1 Label - "Family, A Link to the Past...."
1 Label - "Family, Like Branches on a Tree...."
1 Label - "The Most Treasured Heirlooms...."
1 Label - "Celebrate Your Life..."
1 Digital sentiment stamp - "Every Family has a Story...."
3 Word strips - "Noteworthy", "Generations" and "Captured"
3 Elegant word tags - "Family", "Tradition" and "Memories"